Taking on David's challenge of Prune Blogging Thursday with the serious (though not the skill) of an Iron Chef, I set off with excitment in search of what he claimed were the best prunes in the world. What he failed to mention is that they are also the most expensive prunes in the world. Pruneaux d'Agen. Delicious indeed. David gave me this idea so I take none of the credit other than simply making it, and with what's left of my limited number of brain cells, making is much easier than thinking these days. So on David's suggestion, I gave it whirl - well the ice cream machine gave it a whirl - and somehow, thanks to little prune fairies no doubt, the most delicious Glace du Pruneaux d'Agen et Armagnac or Prune and Brandy Ice Cream emerged from my little frozen miracle machine. I halfed and stewed about 5 of these precocious prunes in a generous cup of brandy until good and mushy. I then added it all to the creme anglaise base and let it seep. I strained out the prune skins, chopped them up and added them to the ice cream as it was mixing. Even I, the most pastry-dessert-uncoordinated-inept person wielding a spatula, must admit that it was delicious. But once again, it was the quality of the ingredients. Let's not forget the most expensive prunes in the world, fresh eggs right off the farm from happy chickens (remember what they say about happy cows! 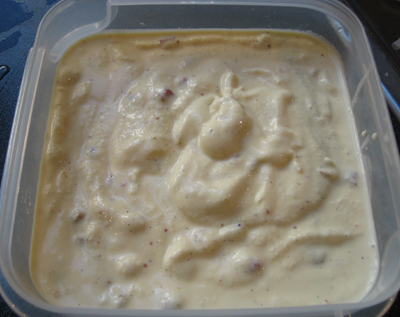 ), and freshly churned cream ladeled out of a 20 liter milk container. Hard to go wrong. 1. 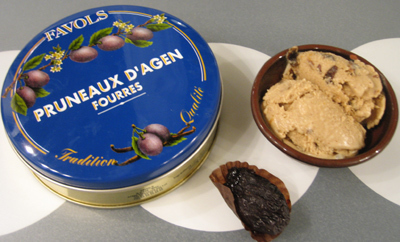 Pour Armagnac into a pan and place the prunes cut side down in the pan. cook over medium heat until soft. 2. 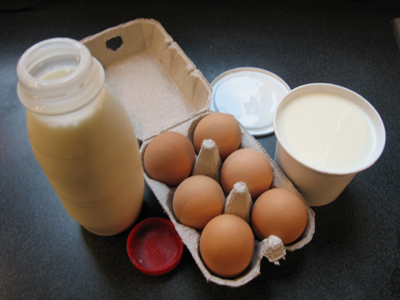 Put milk and cream into a cold pot and place it on the stove. 2. 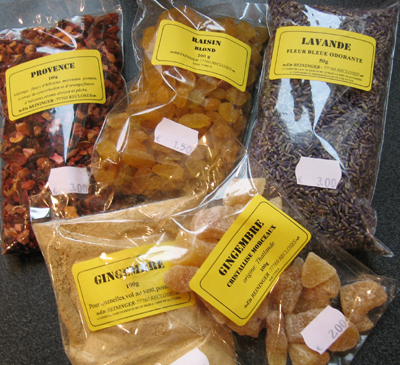 Bring this mixture to a boil, add the prune mixture, stir to combine and remove from heat. 3. 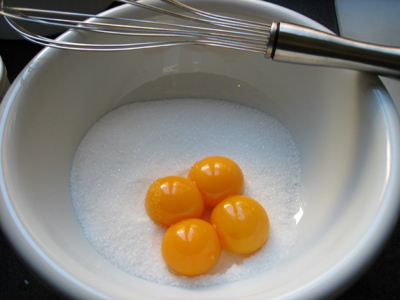 Whisk the egg yolks and sugar in a non-reactive bowl until it is pale yellow. this is called “blanchir” or to whiten. 4. slowly add the hot milk/cream/prune mixture to the yolks/sugar mixture, whisking constantly. 5. Pour this mixture back into the pot and return to the stove top. Cook over medium heat while stirring constantly, making sure you scrape the inside corners of the pot. 6. 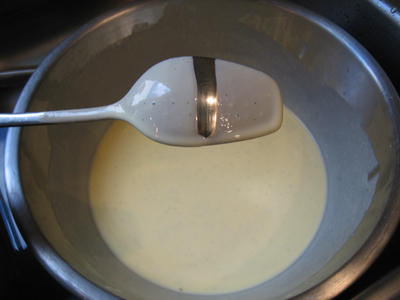 The cream is ready when it is “nappant” or naps the back of the spoon. Run your finger down the back of a spoon and if the mixture doesn’t fill in, it is ready. The picture below is an example of “nappant”. 7. Strain through a chinois (fine strainer) into an ice bath or a bowl set over another bowl of ice. Stir the mixture - this will cool it down quickly. 8. When the mixture is room temp, add it to the ice cream machine and let’er rip! 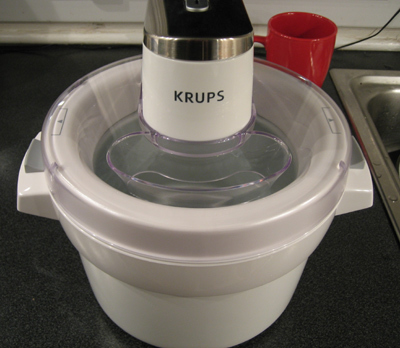 chop up the prune skins and add it to the machine as it is mixing. Freeze and serve. Bon appetit. Laura: "Quick question. I'm making dinner and the recipe says to simmer. What's simmer?" Laura: "What does simmer mean?" Mom: "You're telling me you don't know what simmer means?!?!" Laura: "If I knew what it meant, I wouldn't be calling you!" Click here for more frozen frivolity. So what's churning baby? Tonight it's glace au gingembre (ginger ice cream) with candied ginger. A batch of lavendar creme anglaise is also chilling in my fridge, awaiting the dreaded churn. While trolling the avenue President Wilson farmers market last Wednesday, I came to a screaching halt in front of the spice and herb stand. I wanted to buy one of everything but was able to somewhat able control my wallet and limit my spree to the above items. On the subway home, I realized that I had no eggs or cream but fortunately my Place Monge farmers market is also open on Wednesdays so upon exiting the subway I ran smack in to the egg lady. Luckily she wasn't carrying any eggs so I bought half a dozen along with some fresh, like really fresh, like just off the farm fresh (! ), milk and heavy cream. 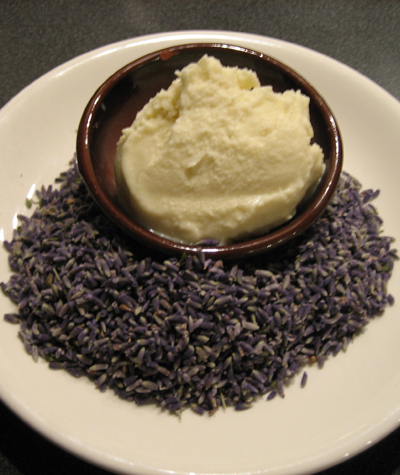 I used the standard vanilla ice cream/creme anglais recipe, however I used only 4 eggs and omited the vanilla for this recipe as I wanted the full force of the ginger and the lavendar. After step 4, I divided one recipe into 2 pots and added 2 tablespoons of powdered ginger into one and 2 tablespoons of lavendar buds into the other. My source of inspiration for this savory wonder came from a dessert I had not too long ago at Le Pré Verre, a bistro du vin in my hood. 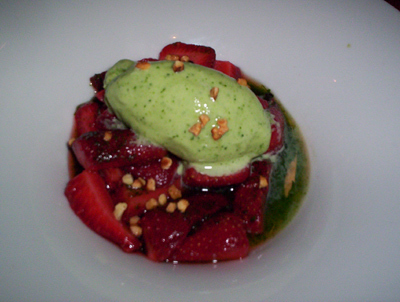 Fraises mariné au persil (strawberries marinated in parsley - pictured to the left) with, you guessed it, parsley ice cream! Also, a huge bunch of deliciously aromatic basil permeated the kitchen as soon as I returned from the market. I only needed half of it for that evening’s dinner and was contemplating what to do with the other half when that little lightbulb over my head illuminated, then whacked me on the head exclaiming “Freeze me you idiot! And you call yourself a chef? !” I don't call myself a chef but that's another story. So I chopped the remaining leaves, plugged in my new best friend, Monsieur Krups, and let’er rip.… an hour later, voila, glace à la basilic! Here is the recipe for vanilla ice cream. I used this as the base for the fig ice cream yesterday then just added chopped fig as the mixture was churning. For basil (or savory) ice cream (pictured to the right), I recommend leaving out the vanilla bean as it makes it a bit too sweet. 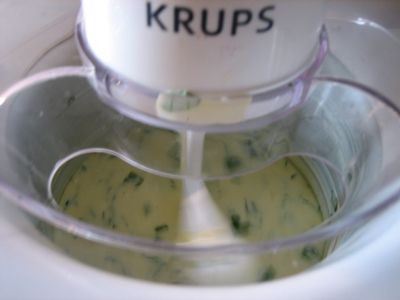 If you want the ice cream to really take on the color of the herb or whatever you are adding (as it is above with the parsley), let it steep in the milk/cream mixture at the start (see step 1. below). Bonjour tout le monde ~ As I mentioned a few days ago, I was so inspiried by Stephanie's ice cream escapades at The Grub Report that I immediately hopped the metro and bought an ice cream maker! I was so excited to set in and get freezing until I realized I had to actually freeze the container first for 24 hours, unlike the fancy shmancy one we had in cooking school where we concocted all sorts of icy delights such as mojito sorbet, cosmopolitan crush, etc. It made for an intersting afternoon, actually many interesting afternoons, until we were busted by red ears. Yes, red ears. As it turns out one of our chef's ears would turn crimson when he drank alcohol and after a few swigs of our cosmo crush his were glowing bright enough to guide a sleigh. This was all unbeknownst to us but...not to the big kahuna chef who walked in and saw said chef's ears all-a-glow and quickly put a stop to our frozen frivolities. I saw these figs at the market today and couldn't resist. The beauty and perfection of food never ceases to amaze me. 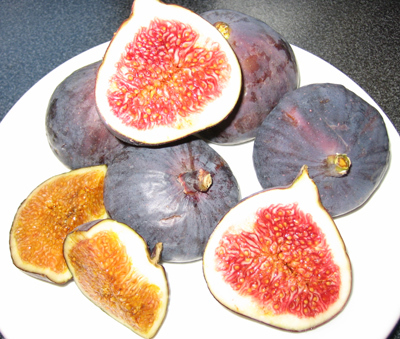 The bright pink and deep caramel colored flesh of these figs stuck me as soon as I saw them. I was actually in search of a potimarron to make pumpkin ice cream but I couldn't resist these. Some milk, some cream, a few eggs (ok a lot of eggs), some sugar, a vanilla bean, a few chopped figs.... et voila! Fig Ice Cream or Glace à la Figue! Bon appetit! I was so inspired by Stephanie's Muhallabia Massawa ice cream escapades at The Grub Report that I immediately set out across town to the BHV, Bazar de l'Hotel de Ville or The Best Darn Department Store in the World as I call it, in search of my new best friend, Monsieur Krups. After this, my next new best friend will be Monsieur Treadmill! The main section is in the freezer chilling as I type so I hope to have an ice cream escapade update for you soon! Stephanie suggested pumpkin and since it is nearly winter (weather-wise) here and little orange globes are popping up in the markets, perahps that will be my weekend project...?